Ready to find your dream vehicle? Let's go. A big part of car ownership is preventative care, and at our service center here at Keystone Chevrolet, we’re here to make sure your vehicle gets everything it needs to keep moving for a long time. We can help you with simple questions about ownership or give you advice about major maintenance decisions. Whether you come to us for routine TLC or find yourself in need of more serious repairs, you can rest just a little easier knowing the experienced and knowledgeable technicians at Keystone Chevrolet are here to help you out when your vehicle needs extra attention. Find us in Sand Springs, OK. If you’re in the market for an incredible new or pre-owned vehicle, Keystone Chevrolet is the place to be. We’re proud to stock a wide selection of all the most popular Chevy models, and our friendly sales staff is here to help you find a car, truck, or SUV that suits your needs, wants, budget and lifestyle. Whether you visit us because you’re in the market for a fresh set of wheels or you want to tune up the one you already own, we’re confident in our ability to help you find just what you’re looking for. Those on the hunt for a brand-new vehicle will love our expansive stock of new Chevrolet models. From the capable Chevy Silverado pickup truck to the family-friendly Chevy Equinox and commute-ready Chevy Cruze, you’re sure to find something here no matter what it is you need. We’re also happy to offer a wide variety of used vehicles, including both pre-owned as well as vehicles from other top makes. You always have a large variety of vehicles to choose from when you shop with us! And when you find the one you want, our financing team can help you get a monthly payment you can afford. 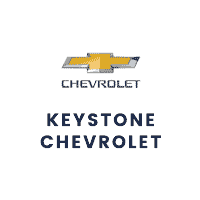 Here at Keystone Chevrolet, our goal is to be here for you not just when you’re shopping for a new or new-to-you vehicle, but for the entire duration of your ownership. That’s why we offer a stellar Chevrolet service center where you can make sure your vehicle is in tip-top shape at all times. Because we have a vast selection of Pre-Owned vehicles, we work on all makes and models! Whether you find yourself in need of major repairs or are just due for regular maintenance, we can get you in and out in no time. Keystone Chevrolet is also home to an expansive OEM Chevrolet parts and accessories department for all of your ancillary needs! Come visit us today at 8700 Charles Page Blvd in Sand Springs, OK, and get started down the road to an improved driving experience.